Three limited-edition David Bowie records will be issued by Parlophone for Record Store Day 2018, which takes place April 21. The first exclusive is Welcome to the Blackout (Live London ’78), a previously unreleased 3xLP set. 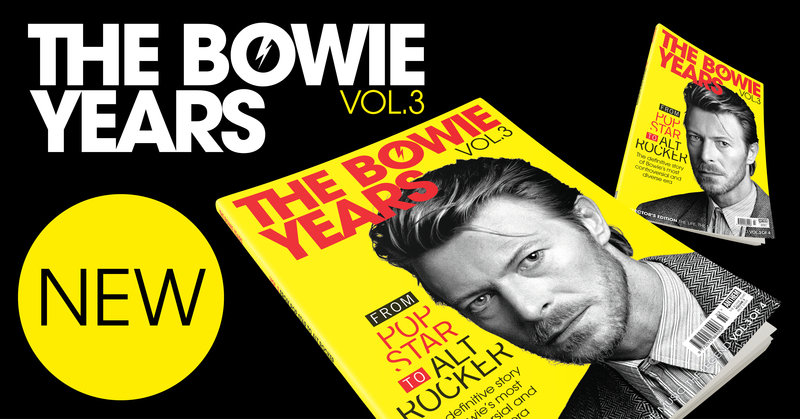 It features recordings from Bowie’s Isolar II tour performances at London’s Earls Court on June 30 and July 1, 1978. The next release is a 12" single that includes the first full-length of “Let’s Dance,” as well as a live version of the song. The final disc is Bowie Now, a rare 1977 US only promotional-only LP, which is now receiving its first commercial release. The tracks are taken from Bowie’s Low and Heroes albums. Find more information via Bowie’s website. Ready for vault material and not just repackagings of the same stuff. He would have never allowed that. David Bowie’s headlining performance from Glastonbury Festival 2000 is getting its first proper release. David Bowie Glastonbury 2000 is set to be released on DVD, 2xCD, 3xLP, and digital on November 30, featuring the Thin White Duke’s full 21-song performance. Bowie’s headlining slot came a full 29 years following his first appearance at the festival in 1971, and saw him play a greatest-hits set with songs spanning his entire 20th century career. The new release features remastered audio in addition to show notes from journalist Caitlin Moran. It's fun but I've never been a fan of that track! Yes NF let's hope he can pull it our of the bag whether it be a pop album or more experimental one, well if he ever does come back that is! PARLOPHONE SET TO RELEASE 7" VINYL SINGLES BOX SET OF PREVIOUSLY UNRELEASED* DAVID BOWIE RECORDINGS, INCLUDING EARLIEST KNOWN VERSIONS OF SPACE ODDITY. With 2019 marking 50 years since David Bowie’s first hit, Space Oddity, we are excited to announce that Parlophone is set to release a 7" vinyl singles box set of nine previously unreleased recordings* from the era during which Space Oddity was first conceived. The title: Spying Through A Keyhole, is a lyric taken from the previously unknown song: Love All Around, and though most of the other titles are known, these versions have never been officially released until late last year (see footnote). Most of the recordings are solo vocal and acoustic home demo performances, unless otherwise stated. A charming demo from 1968. The lyric and arrangement variations lend weight to the theory that this is possibly the first ever recorded demo of one of Bowie’s most famous songs. Spying Through A Keyhole will be limited to a vinyl only release in the spring. However, the recordings may appear in the future on other formats. More details and actual release date to follow from Parlophone. I've been having a David Bowie binge the last day or so. Loving it. Going to Lazarus when it's coming to Amsterdam. Parlophone is commemorating this year’s 50th anniversary of David Bowie’s classic “Space Oddity” with a series of box sets. They first announced the Spying Through a Keyhole collection, due out April 5th, back in January. Today, they’ve detailed another 7-inch vinyl box called Clareville Grove Demos. Due out May 17th, the three-piece set features six home demos Bowie recorded alongside John “Hutch” Hutchinson at the Clareville Grove flat the former lived in with his then girlfriend, Hermione Farthingale. (The three of them — Bowie, Hutch, and Farthingale — had performed together as Feathers.) The cover image was taken by Bowie’s manager at the time, Ken Pitt, in that very apartment. Of the six tracks, four have previously been unreleased. That includes “Love to the Dawn”, and early version of “Cygnet Committee”; “Ching-a-Ling”, a 1968 song Bowie originally recorded with his Turquoise trio featuring Fathingal and Tony Hill; “Let Me Sleep Beside You”; and “Life Is a Circus”, a cover of a Roger Bunn song recorded by Djinn. Each vinyl single is designed with a label emulating Bowie’s handwritten song titles. Find the box artwork and tracklist below. You can also find more Bowie vinyl over at ReverbLP. So..... I hope that you will like Dog Man Star ...It is my favourite Suede's album.